If you’re squeamish, don’t read this post. I’ve just spent ten minutes looking for something illustrative on YouTube–and I couldn’t find anything. ** But it strikes me as useful knowledge, so I thought I’d describe it–though I don’t know how effective words alone will be. First of all, for me knife fighting isn’t about the horror movie leap-from-the closet overhead stab; it’s not about the tip of the blade. It’s about the edge. You may need to practise this so you can do it easily. Crouch, so that your torso is curved away from your attacker (you will look a bit like a boxer). Move in to your target, slashing in a general upward path, in diagonal curves. Imagine a single snaking path. (The brain has a much harder time calculating endpoints when an object doesn’t travel in a line–so if you use arcs your opponent finds it harder to block.) 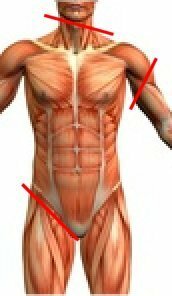 I’m right-handed so my first cut would be from lower right to upper left–across, say, the femoral artery–second cut, from left to right, across the brachial, the third, right to left again, across the carotid. It takes about 1.5 seconds. Flick flick flick. Then you step back and watch them bleed to death. Or, if you missed the arteries, they writhe helplessly–because you probably at least got the tendons. Oh, and if you were wondering what we cooked for Mother’s Day, it’s a pork-and-beans-and-red-pepper thing I invented a few years ago***. Served with two kinds of rice (I only eat whole grains, but K and her family like the white stuff with lots o’ butter and pepper) and steamed broccoli. Followed by lingonberry pie and ice cream. * Just in case anyone is wondering if I’d fight for possession of Kelley: no one possesses Kelley; she chooses for herself. Duh. And if she couldn’t speak up and/or defend herself for some reason I’d nominate Aud as her champion. If Aud were busy then, yeah, I’d do it. I’d win, too (as long as I could, y’know, fight sitting down). ** Huh. I’ve no idea what style it is I use, no idea where I learnt it. I’d always had a vague notion that it was some kind of kali (though I never studied kali). It’s all a bit of a mystery. *** At some point I’ll write out the recipe if anyone is interested. The knife fighting I was taught is of the one-hand-forward with the knife at the hip to last out– let the enemy focus on the hand that is forward (hopefully with a coat or something in it) & then attack out. Thanks for sharing. I always feel like a psycho when I tell people I sleep with a sword by the bed and have a cleaver in the drawer by my living room recliner. I doubt I’ll ever have a need to use them, but I feel more secure knowing they’re there. Interesting hold. It also gives you the opportunity to better stab, letting gravity help out. The nebbiolo grape is a queen among unequals! We have the juice of it shipped from out your way and make a very passing barolo with it. Great knife fighting tips :) Hope I never have to use ’em, but better to know something and not need it than need it and be lost. I always figured if someone attacked me in my own home I’d throw the unabridged dictionary at them and run like hell. Thanks for the artful and bracing directions if I ever decide to use a knife. <>mordicai<>, yes–even if it’s only being aware that an empty hand is a weapon, too. <>dianneordi<>, how fast can you get them out? Can you do it in the dark? <>jennifer from p<>, I’m addicted to Mediterranean wines. American reds are…well, they feel kind of muffin-topped to me: they hang over themselves, feel flabby. I admire structure. Whites, eh, I just like a good summer quaffer–but if I’m going to spend money, then a Merseult is just the thing. <>barbara<>, the safest thing is to run, period. As Aud would say: if you walk into a bar and there’s a man with a knife, what do you do? Walk out again. nicola — the cane sword is propped by my bed, so I can (and have) gotten to it as fast as getting out of bed. There have been several times that I’ve grabbed it when I’ve heard strange noises and lay it on the bed with me partially unsheathed and went back to sleep. The cleaver is lying where I can get to it as fast as I can the remote when I’m in the living room watching TV. In the office, I’d probably reach for scissors. In the kitchen, a carving knife. In the bathroom, a metal flashlight, although just the sight of me naked would probably scare off most attackers. When I was a teen I was once followed and harassed, then surrounded by four school bullies in a park. One of them pulled a knife and threatened to cut my hair. Fortunately, they weren’t very bright and probably more interested in scaring me than doing actual damage. I was able to run to the nearest house and call the police. Hopefully that’s the closest I’ll ever get to a knife fight in my lifetime. I hope it’s the closest, too. I hope for everyone reading this blog that they never have to feel bullied. This reminds me a bit of Sam Phillips’s knife attack scene in Die Hard with a Vengeance. Perhaps not her stance and aim, but that was how she held her knife. I don’t remember that scene. Was it near the end? It was perhaps a third of the way through? In the bank vault.